During the PADI Divemaster program, you learn dive leadership skills through both classroom and independent study. You complete water skills and stamina exercises, as well as training exercises that stretch your ability to organize and solve problems as well as help others to improve their diving abilities. As you progress through your Divemaster course, you’ll expand your diving knowledge, hone your skills and increase your confidence. Then as a PADI Divemaster, you’ll use these attributes to lead, mentor and motivate other divers and experience the joy of seeing them transformed by the majesty of the aquatic realm. Course: $700 This fee covers pool fees, instructor fees, and instruction. Once you purchase your training materials, read the text, watch the DVD and complete knowledge review questions at home, at your leisure. 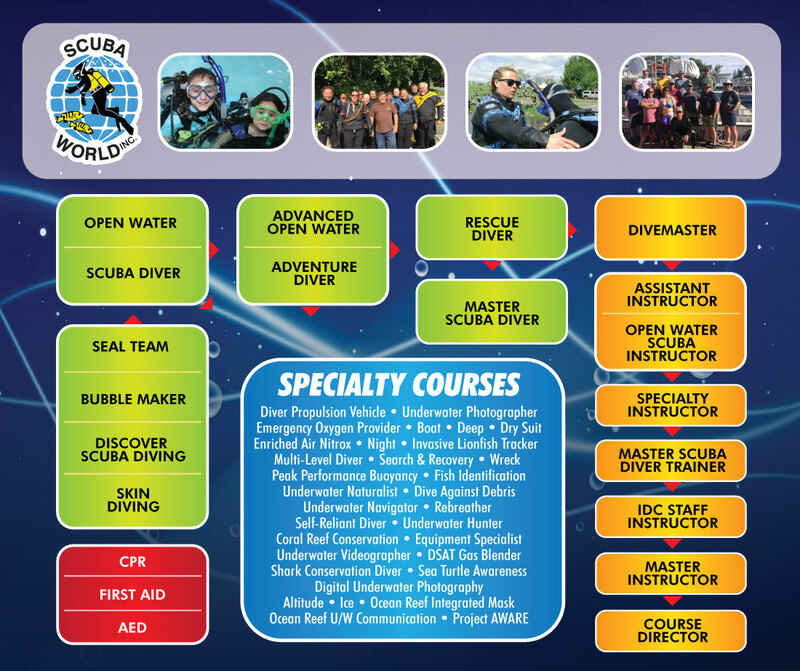 Then schedule your academic sessions with the knowledgeable and friendly Scuba World Instructor. We offer weekday, weeknight and weekend sessions. The academic portion is taught at Scuba World. What are the skills evaluation and internship? During the course you will be evaluated on your general diving skill and your ability to demonstrate basic skills to a novice diver. The internship consists of serving as an instructional assistant for other levels of training to gain familiarity with the diver training process. Accommodations to stay overnight. Either motels are $110 per night or camping at the quarry is $10 per night.